A conveyor belt positioned after the cutter will automate cut piece collection. It also gives improved cut length accuracy & cut quality, by supporting the extrudate as it exits the cutter. They can also improve quality by automatically separating scrap lengths from good product. The most popular type of collection system is the high pressure air jet option, where cut lengths are blown off the side of the belt. The air nozzle design spreads the air blast over the widest belt area, to ensure a smooth discharge of the cut length into the collection bin. 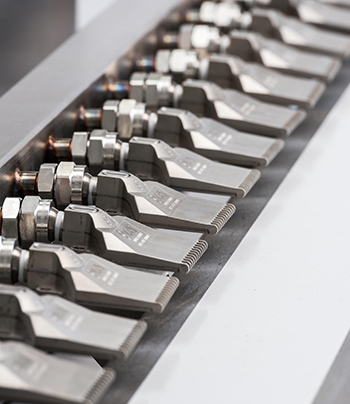 The nozzles are also adjustable in direction so they can be moved to handle different sizes & weights of extrusion. The activation of the air & the duration of the air blast are controlled from the cutting machine. Multiple collection bin systems can be configured, with separate zones for collecting scrap lengths.